The Master teaser trailer: Joaquin Phoenix is frightening as Freddie Quell, but who is Quell? What’s Going On in the Teaser for The Master? 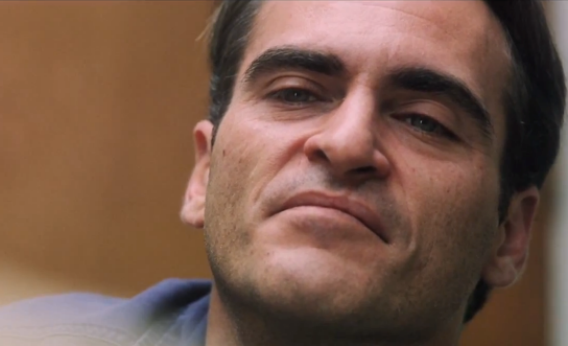 Joaquin Phoenix plays Freddie Quell, a mysterious character in The Master. Still from the teaser for The Master. Our first look at Paul Thomas Anderson’s hotly anticipated and highly controversial new film The Master hit the Web today, and it’s a bit of a curveball. While up to now debate over the film has centered around the many similarities between Philip Seymour Hoffman’s character, Lancaster Dodd, and the founder of Scientology, L. Ron Hubbard, the teaser instead focuses on the film’s other lead character, Freddie Quell, a boozy Navy veteran played by Joaquin Phoenix. Both wrote their ultimate secrets in a book that is said to kill its readers or drive them mad. They are obsessed with motorcycles. Their tantrums are monumental. Each has a wife named Mary Sue. But if Anderson is approaching the story as a bit of a film à clef, the real-life equivalent of Freddie Quell is not so obvious. Cieply writes that Phoenix’s character “shares what Mr. Anderson’s associates say are accidental similarities with the filmmaker’s father, who died in 1997.” Ernie Anderson, was a veteran of the Pacific theater of World War II, as Quell appears to be here. The stories of Quell and Dodd then come together as Quell becomes Dodd’s “right-hand man,” according to one synopsis of the film. Then, “as the faith begins to gain a fervent following, the onetime vagabond finds himself questioning the belief system he has embraced, and his mentor.” While Ernie Anderson worked as a voice actor in Hollywood for more than two decades, and so is likely to have brushed up with Scientology, I can’t find anything that would indicate that Anderson had any such relationship with Hubbard. Regardless of its precise relationship to recent history, it’s clear from this clip that The Master will fit right in with Anderson’s past work, and won’t likely require any topicality or factual basis to stand up. Structurally, the teaser is almost identical to the teaser for There Will Be Blood—and the visual style, far from the colorful clubs of Boogie Nights, most closely resembles the harsh Kubrick-inspired compositions of that film. Here the solitary drunkard scowling, working with his hands, and battling against his fellow men—all while taking part in a form of confession—is Phoenix, whose actorly transformation appears to be as frighteningly complete as Daniel Day-Lewis’s in the Oscar-winning role of Daniel Plainview. The discordant violins of the score, too, resemble Jonny Greenwood’s work for There Will Be Blood, though some of the erratic percussion sounds like portions of Jon Brion’s score for Punch-Drunk Love. As with all of Anderson’s films, The Master looks to be rooted in California, where the director grew up. In other words, the real master here may be Anderson himself. However, for a full look at exactly what he’s up to here, we’ll have to wait until October.